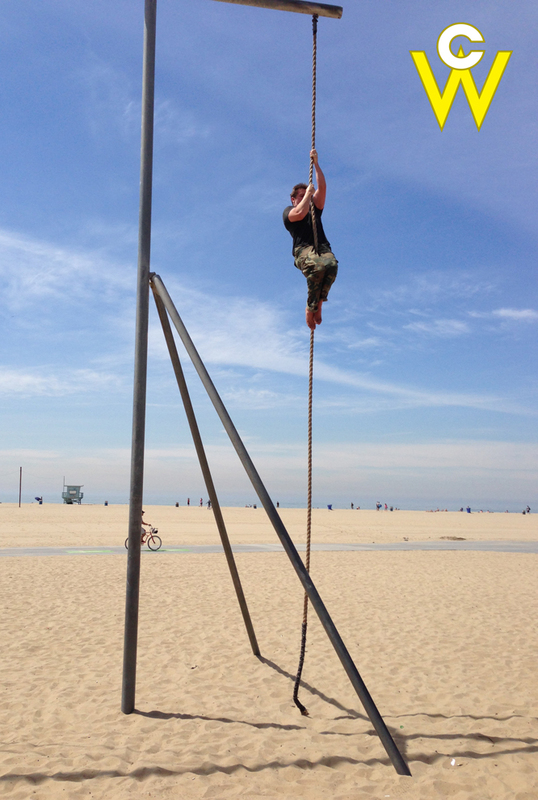 If I had to choose one upper body exercise for the rest of my training days it would definitely be the rope climb. Of course, we don’t live in a world where we’re relegated to only one exercise, but if I had to choose one that would be it. No other upper body exercise works as many muscles as intensely, from your abs to your forearms, and everything in between. However, the rope climb is an advanced exercise that might not be appropriate for many of you, at this point. The people who run into a problem with the rope climb, whether it’s pain in the shoulder, elbow or anywhere else are usually not ready for such a challenging move. No matter how great the rope is, you must pass through the ranks before adding it into your program. 1. 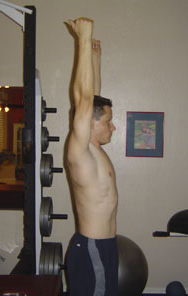 Do you have sufficient thoracic extension? Stand with your arms straight down at your sides. With your elbows locked and palms facing each other, can you lift your arms up in front and overhead without the bottom of your ribcage elevating? If you don’t know how to feel the ribcage elevating, try to do the same movement while keeping your abs braced like someone was about to punch you in the gut. Now can you lift your arms up perfectly perpendicular to the ground? If not, you need to improve thoracic extension. One of the most effective ways to improve thoracic extension is with the high bear exercise that’s taught by practitioners of Dynamic Neuromuscular Stabilization (DNS). Since I’m certified in DNS, that’s exactly what I use with my clients. If it’s not possible to find a DNS-certified trainer in your area, the next best option is the downward dog (aka, downward facing dog) pose taught in yoga. The key is to hold the highest hip position while breathing into your lower abdominals, and keep your chin tucked. Try that for one minute then retest your overhead arm lift. If it worked, now you have a corrective exercise that you should perform before any pull-up or rope climb workout. But if you still can’t elevate your arms high enough, keep working on the downward dog hold throughout the day until you pass the test. 2. Can you perform 10 pull-ups with a narrow, hammer grip? The rope climb requires high levels of strength because you’re temporarily in a position where only one arm is doing most of the work to elevate your body through space. That requires considerable strength. So if you can’t perform 10 pull-ups with a narrow, hammer grip (the best carryover for the rope climb) keep working on building it up. The other option, if you’re a low-rep training machine that considers anything over six reps to be endurance work, is to be strong enough to knock off five pull-ups with 25% of body weight attached to a chin/dip belt. Once you’ve passed the mobility and strength test you’re ready. The most common problem people have with the rope climb is an imbalanced pulling technique. Since none of us are perfectly balanced – one shoulder is always weaker or stiffer than the other – it’s imperative to build up your pulling technique by reaching an equal distance with each arm. If you let the stronger arm reach further and pull harder, your strength and mobility imbalances will only get worse. And I can assure you that pain in the elbow, shoulder or neck will soon follow. By pulling equalling with each arm you can help put your upper body strength and mobility back in balance. Like any new exercise you should start slow and do less than you think you need, then slowly build up from there. The goal is to be able to perform five climbs per workout at least three times per week. The height of the rope isn’t important, what matters is your set lasts 10 seconds from start to finish. So if you only have an eight-foot rope, climb up and down it as many times as you can in 10 seconds. The purpose of limiting the sets to 10 seconds is to ensure that your largest, strongest motor units are constantly in play. Beyond 10 seconds they start dropping out. Now, the obvious downfall of spending so much time talking about the rope climb is that many people don’t have access to a rope. I encourage all of you hard-training lifters out there to find a way to hang one in your yard, garage or dining room. If adding a rope into your program absolutely isn’t an option, it’s probably safe to assume that you have a playground or park nearby that has a swing set. So your other option is to climb up and down one of the support posts. *You don’t have to passively rest for 3 minutes. Perform an upper body pushing exercise (e.g., dip) during that time, or put the climb within a circuit where you have at least three minutes before you repeat an exercise. This entry was posted in Gain Strength, How To Build Lean Muscle, How To Get Ripped by Dr. Chad Waterbury. Bookmark the permalink. Agreed, it a fantastic exercise! A tip for any parents out there – Your backyard rope can double as a tire swing for the kids when not in use. I have a rope in my backyard that I use for climbing (hangs from a tree branch – about 12 feet high), but the rest of the time I have an old tire hanging from it so that my kids can use it. It attaches/detaches in about 2 seconds via a rockclimbing carabiner. Might be useful for those with limited space. Also, cheapo rubber-grip mechanic’s gloves are handy for rope climbing, especially if your rope is higher and you’re worried about slipping as the hands get sweaty. Great article and great stuff from you in general lately, Chad. I’m a trainer in Phoenix – how can I get you to come out here and do a workshop? CW: David, you should definitely come to the seminar I’m doing with Craig Liebenson on May 4 at the Movement Performance Institute on Sepulveda by the LAX airport. – Are you still recommending the Waterbury Diet, e.g. a 20hr “fast” with 2-3 whey pulses during the day as a baseline? So the recommendation on fruit+whey pre and berries+whey post-workout is just a slight modification and benefical addition to the original WD? CW: Correct. I’m updating the WD in my next ebook, HFT2. Hey Chad, great post, the downward dog helped a lot! Quick question, do you still stand by what you said a couple years ago that climbing a rope is one of the best exercises for biceps? Also, off-topic, do you still think dips are one of the best horizontal presses one can do, even if they’re on parallel bars (obviously its easier to add a lot more weight on parallel bar dips than on ring dips)? Thank you for all your great articles!